Getting ready to start day 1; is there a formal calendar I log into to do this? Nope... feel free to join a group in the Join the Whole30 section or start a log to keep track of your food and mood etc in the My Whole30 Log section. We don't have an app so not sure what that's referring to but feel free to post in any thread here you would like to participate in. Hello. I am quite new. My start date is Febr 14, 2018. I need a day ot two to ready my kitchen and my mind. I live alone, so plan to read and/or post on this forum, so I appreciate your being here. Hello! I'm new, too. Being German, I am not a native speaker, so I am sorry in advance for any misunderstandings that may happen because of my English. My start day was Jan 2nd, 2018, so it's already day 47. I feel so much better, it's amazing! The recipes are delicious, so there isn't much that I miss. I want to go on for a while to get rid of my bad snacking habits, especially when I'm stressed out. To those of you who are about to start or suffering from deprivation effects: hang on, it's really worth it! If there is anything I can do to support you, please let me know. Yes! I am new here! Excited to get started . I need to read the books, so slowly but surely I will be in the swing of things soon. I am in my early 50's and still loving life. I am a mom of 3 beautiful daughters, and my husband and I have been married for 31 years on 2-14-18! I need a buddy to talk with. Please and thank you! First of all, English is not my native language, so I am really sorry for all the present & future typos! I didnt read any of the books completely before start, but during the process. Again, English is a bit of a gap, and it takes me more time to read it. I followed all the rules, without cheating, at least consciously. And the truth is that I discovered that in my country, the labeling laws are very lax and have no obligation to put many of the most relevant data. Still, I think I have achieved the goal based on cooking and eating fresh products. I am still amazed at how easy it has been to make this challenge, and as you can imagine, I intend to keep it as my general eating habit. I must be one of those weirdos who have not noticed many side effects during the 30 days, I mean those that can be seen in the calendar. And I was looking forward so freakingly bad for the tiger blood!! I am immensely offended by the amount of posts in my native language that refer to the Whole30 and in the end are related to recipes and post about Paleo diet camouflaged. It is not the same, please stop BS! I just finished my 1st Whole30 and I have to admit that I am delighted with the results! I didn't loose too much weight, but it certainly change my point of view about food and health. Thank you so much for creating the Whole30!! First day of Whole 30! First timer here..and doing it alone. That's why I'm on this forum!!! First day and I made it. Going to get a good night's sleep and do it again tomorrow! Hi, I am on Day 6 (would have been day 7 but I messed up last Sunday on my first day when I failed to read the label on my applegate turkey and accidentally had carrageenan). I am feeling pretty good but I eat really healthy most of the time anyway so in a way this is not a big change for my body except for the total elimination of certain ingredients. I haven’t had the fatigue or crankiness or other physical symptoms many people experience (so far) but I am a person who is always hungry so I do eat a lot of compliant snacks and fruit. I have had more nuts in the last week than the previous whole month- haha! I made the decision to do this program to see if I could eliminate my mild to moderate reflux (for which I refuse to take regular medication).For others who have done the program for the same reason, did you also eliminate nightshades or other trigger foods?? I have done a strict reflux diet before (no alcohol, caffeine, chocolate, mint, citrus/ tomatoes or other acidic fruits, no vinegar or citric acid, etc) and it did not help much at all- I just unintentionally lost enough weight to look like a skeleton, which is not my goal. So I have started this whole 30 with the idea of allowing myself to eat anything compliant with the plan that I want, including tomatoes, marinara, salsa, pickles, marinades or dressings with lemon or vinegar, etc. because frankly it is already so restrictive that I didn’t want to unnecessarily eliminated items that are compliant. But I am a little concerned that I haven’t seen real improvement in reflux the first week. Should I eliminate tomatoes, vinegar based dressings, etc?? Or just wait and see what happens in the next week or two? Hey, @KathrynW. You've only been at this a week, which might be a little soon to see improvements. I would recommend that you try to limit the nuts and seeds, though -- they're not the best fat source, and they often cause digestive issues for people. Try to limit them to a small closed handful at a time, maybe every other day or so. There are other fat options that would be better choices -- you could make mayo or dressings, have olives, avocado/guacamole, or any kind of coconut products. If you know there is something that causes issues for you, definitely leave that out, but if you have done a reflux diet before for at least a few weeks and saw no improvement, it makes sense that you may not have a problem with the foods that were eliminated in that. If you continue on and still aren't seeing improvement toward the end of your Whole30, or if at some point your reflux seems worse, you can always think about eliminating more at that point. It might be worth keeping a food log noting what you ate and how your reflux is, so that if there is something that makes it worse, you may start to see a pattern. This could be as simple as a notebook you write in or a Word document on your computer, or even pictures on your phone of your food and notes on a calendar app about symptoms. Hello! 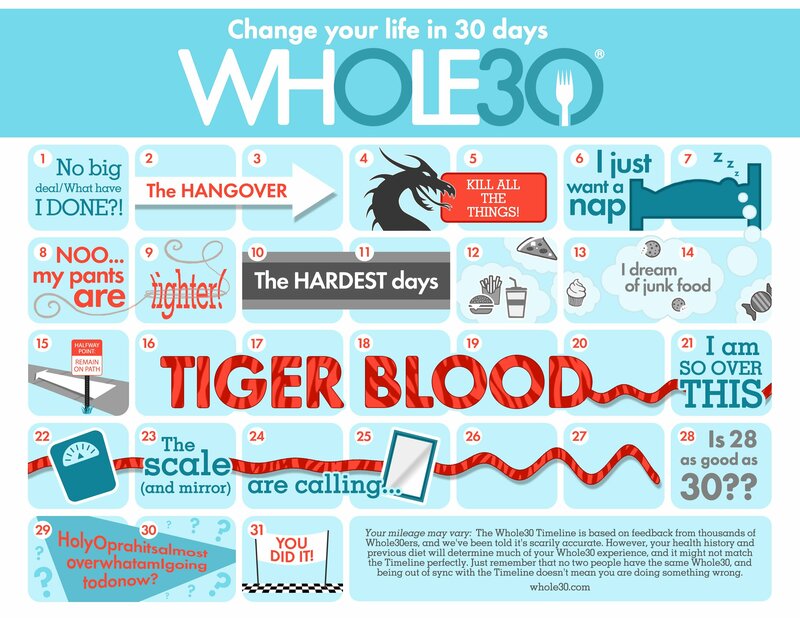 I will be starting Whole30 on Monday, Jun 4. Today, I need to purge my kitchen and plan my meals for my 1st week. Tomorrow, I will grocery shop and prep my meals. It's nice to meet you all. Hi, I am new to Whole30 and my start date is tomorrow, Monday June 4, 2018! I am excited and a little bit scared. I may have difficulty trying to prepare my meal planning and keep up meals to my family's liking. I am about to start this program once again. I completed the whole food 30 program in 2016. I am amazed that one again, I have allowed myself endless endulgences that have one again caused my body to feel horrible. Why? Who knows. But here I am once again trying to get out of this rut that i have created for myself, and get back on a path of eating to be healthy. A painless body would be nice too. lost weight and became much more active. Hello to all... i hope to encourage, as well as be encouraged. Hi, my name is Deb. I am starting Whole30 for the first time in August after I get back from visiting family in Ohio. I'm a little nervous about cutting out so many things but I'm hoping to make some good connections on here to help keep strong. It would be nice to have someone to chat with when I'm tempted, tired and don't feel like cooking etc. I'm hoping to get that energy that everyone mentions. I have a busy schedule with work and kids and by the end of the day I have little energy/time left to think about working out. Anyhow if anyone would like to start the journey with me on August 1st the more the merrier.